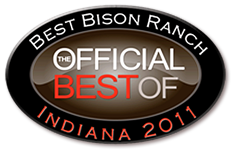 Cook's Bison Ranch is honored to be selected as Indiana's best bison ranch by www.OfficialBestOf.com. The Official Best Of solicits nominations for their website after having searched online travel resources to determine which nominees will be named best of. No attraction can contact them for inclusion. Selections are based on independent reviews from travelers across the country. As part of our selection, we will also be interviewed for a 30-minute television special, the Official Best of Indiana 2011, which will air on Saturday, October 29 at noon on WISH/CBS 8 (Indianapolis) and on Saturday, October 29 at 11:30 am on WBBM/CBS 2 (Chicago). Film crews will be out to the ranch shortly to begin filming and interview family members on what a bison tour is like and to be educated on the fantastic animal that is the North American Bison. Cook's Bison Ranch is a family-owned and operated farm located in Wolcottville, Indiana specializing in naturally raised bison. Tours of the farm to see and feed the bison run throughout the summer and we accommodate school groups, churches, and bus tours as well as the casual visitor and family who want to learn more about bison. Cook's Bison Ranch also distributes our naturally raised, naturally lean, and naturally delicious bison meat to retail stores and restaurants throughout the Midwest. We do not provide our animals with growth hormones, steroids, or antibiotics, and visitors are responding to the fantastic flavor and wonderful health benefits of bison.